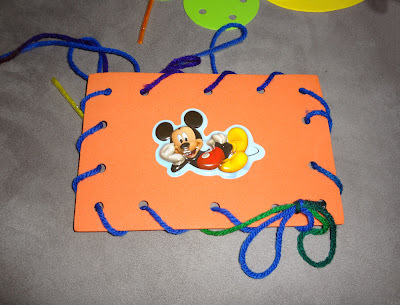 Instructions for making the lacing shapes activity can be found on the blog Tot School. Allow your child to decorate the lacing shapes with markers, stickers or even glueing smaller shapes inside the lacing area. Use permanent marker to list numbers (1-2-3 etc), Shapes (triangle, square, etc) or letters (a-b-c, etc) next to each hole. 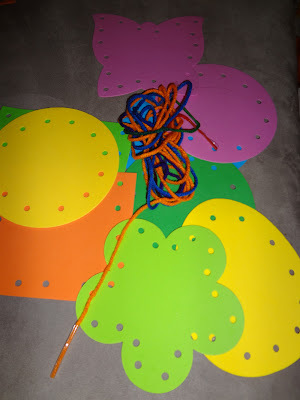 Say the number/letter/shape as they lace that hole. Use 2 strings in opposing colors to lace the entire shape. Illustrate how to "tie" a bow.